Right after my last post, many pallets of brick arrived. I got so excited to think that the brick would now be layed. 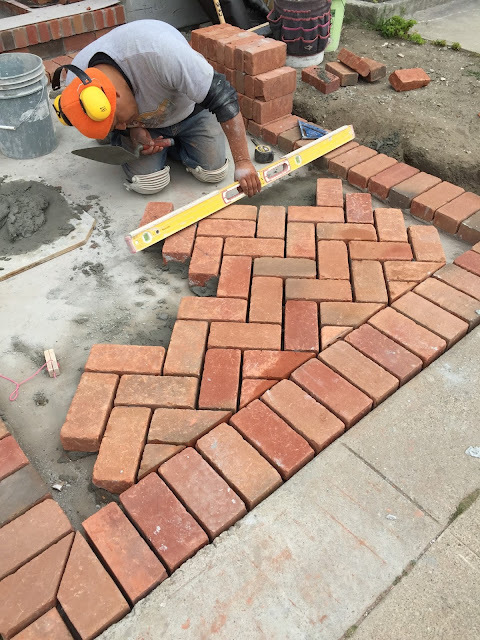 The front walk way design is determined. Herringbone. Day two. 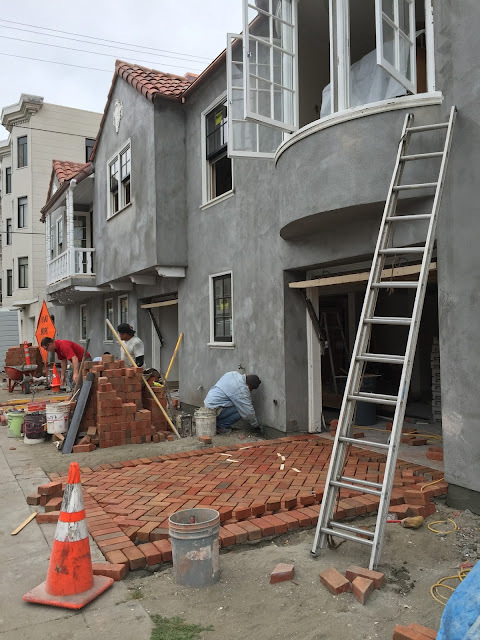 The front walk was bricked, but two weeks later, the stairs still are only three steps completed. However, the "driveways" in front of the garage doors were layed. 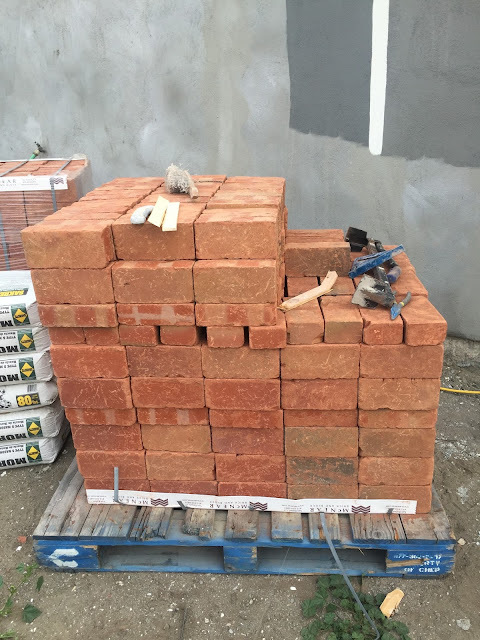 In the concrete world we now live in, brick is a welcome relief. Meanwhile, the brickwork has once again stalled. 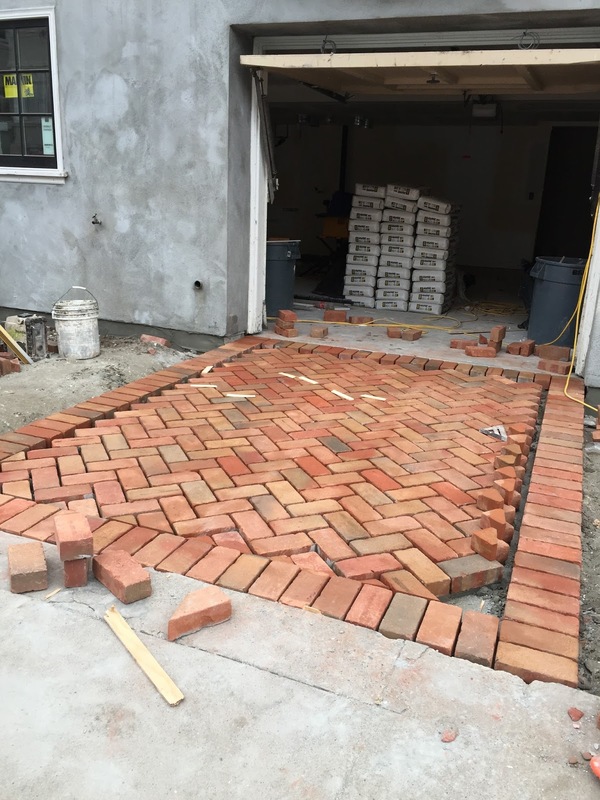 Yes, the "driveways" are layed, but no grout. That was a week ago. Delores! My heart leaps when I check in and see that you've posted. 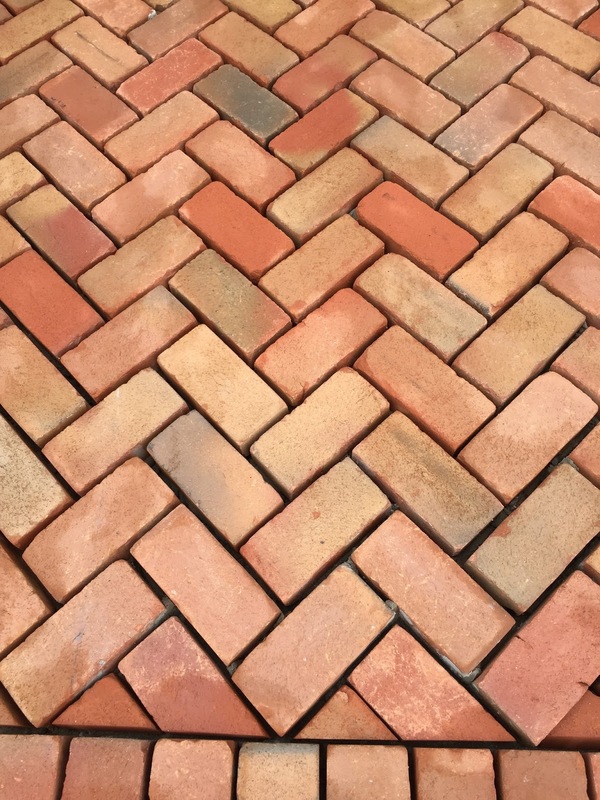 I love the brick, the colors are absolutely perfect. Speaking of color, do you remember the name of the green base color you had your cabinets painted in at the other house? Anyway, hang in there, perfection (or as close as we humans can get) takes time! I'm with Cyndy,was so excited to see a new post!!!!! Hang in there, it will beautiful when it's all finished. Looks like you are deciding on "shades of grey" for the exterior??? Thanks for the update. Oh, I love the trades. They come in and do a bit of work to get things going, then they go off to another client and do some work. It keeps us all on the hook with them. Beautiful brick! It will be so worth the wait! Hang in there! Delores: When we were in Rome in 2008, we visited a church called "Quattri Santi Coronati" not far from the Coloseum. The church is designated a Unesco World Heritage site. 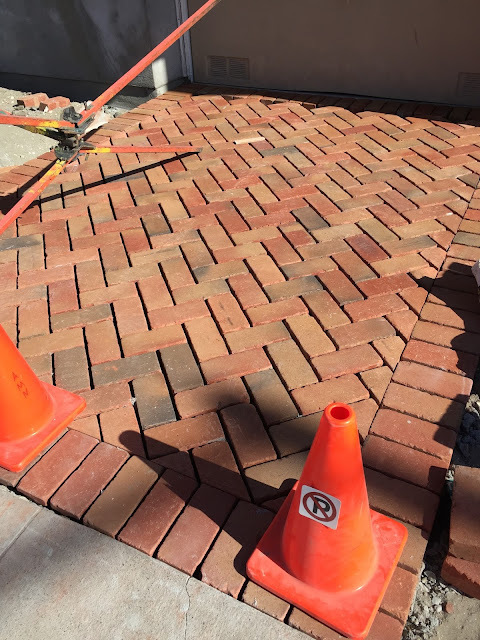 Anyway, at the time, they were repaying the courtyard with bricks in a herringbone pattern very similar to yours. When I saw your brickwork it immediately reminded me of this charming church. It's going to be so beautiful! It'll be worth every moment of aggravation you are now experiencing. Hang in there! I love seeing your story unfold. If my reno isn't moving along, I can always look to other for inspiration in the process. I can't wait to see every detail that comes along. Enjoy the ride!! !